please note: We have frozen the state of BarbaBatch. This means BarbaBatch will remain a 32 bit application. To run BarbaBatch you should not upgrade your operating system beyond MacOS Mojave (High Sierra is recommended). If Apple maintains its standard patching policy, it will update Mojave with security fixes until the fall of 2020. BarbaBatch has become a sonic archeology tool, reading and writing files of DAWs that we ourselves can not find anymore. We have decided not to risk breaking backward compatibility by patching crucial 32 bit routines to 64 bits. If you rely on BarbaBatch we advise you install Mojave or earlier on a partition of your drive and convert from there in the years to come. 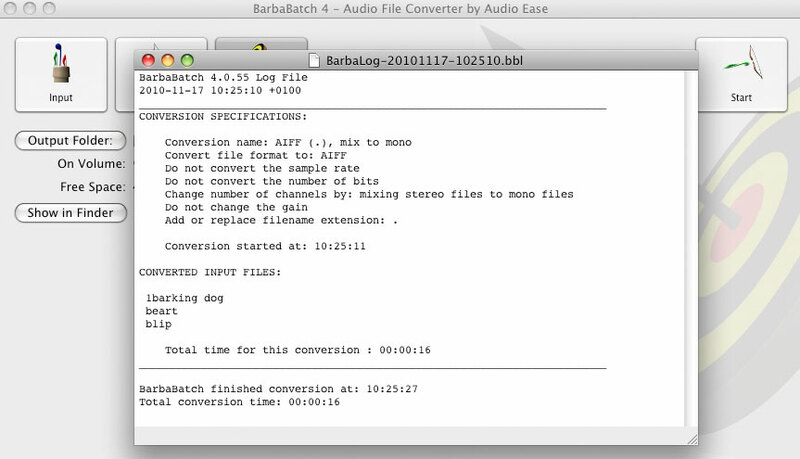 "Screaming-fast conversions with awesome-sounding results"
"The best conversion tool money can buy"
"Excellent sound quality, fast processing, extensive file format support"
"Best-Sounding, easiest to use batch audio file format conversion package"
"Quick and Easy to use, BarbaBatch produces great sounding output, and it's the most efficient batch-processor"
The Barbabatch demo converts only the first 30 seconds of the first audio file in the batch. The demo does process all other files in the batch, but these will be silent. This way you can properly evaluate how the complete batch process will work. Fixed a permission error on M4A encoding. Fixed a memory leak in the gain section. Fixed a bug in the normalizer and gain section that could render stereo input dual mono. Sound Designer 1 files have a compatability problem with modern compilers. These files can still be read, but not written. Solved incompatibility with MacOS 10.4 and 10.5. Solved incompatibility with Broadcast Wave files from Pro Tools 10. Wave 32-bit float files were interpreted wrong on PowerPC. Broadcast Wave MPEG files had one wrong chunk header. MP3 files could fail to embed ID3 tags. Pro Tools generated AIFF files were interpreted wrong. Using a non-SATA or IDE boot drive didn't authorizate properly. QuickTime 7.5.7 (included in MacOS X 10.5.6) has a bug that prevents BarbaBatch from extracting audio data from files in its preferred manner. BarbaBatch is now a Universal Binary, increasing performance on Intel Macs. Added preference to recognize number files as split (.1/.2 etc). Default is off. 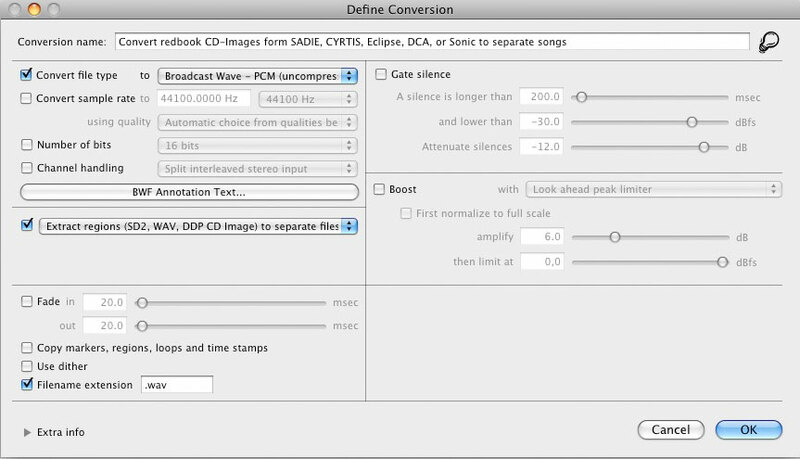 Importing QuickTime files and MP3, followed by sample rate conversion gave missing audio blocks in the output. Output file names could carry double file type tag (i.e. .wav.mp3). Added region support to AIFF files, as it is implemented in Pro Tools. A conversion that only converted a snippet of the file didn't work for split stereo and split surround. Reinstated split file name extensions (L)/(R) for old Logic archives. Strictly enforce file name extensions. As OS X uses file name extension almost exclusively for type identification it hardly makes sense anymore to not add the proper extension for a specific type. A side effect of this is name ambiguity when the input folder containts, for instance, files calles "somefile.wav" and "somefile.mov" and both are converted to AIFF. As both outputs would be named "somefile.aif" a duplicate file name error is logged. Normalize and gain sections could cause wrapping audio if end level was 0dB. Naming conventions have changed a little: any file that has a fixed type extension will get that by default. The option in the conversion window to extend the file name only works for non-standard extensions. Improved surround file support; there were a few omissions in the last release. Wave a-Law and u-Law files gave noise. Options to output split surround files: in the previous version a split surround file would come out as interleaved, even though that wasn't specified. Interleaved surround files now have channel tags to avoid fixed channel ordering. Input files need such a channel tag to be interpreted properly. When adding split stereo or surround file sets, BarbaBatch would generate an error as it tries to process the next file in the set. This would give 'file busy' errors. Adding surround files now has the same restrictions as stereo split files: adding one file from the set adds the complete set, so adding yet another file from the set gives a warning to that effect. Importing QuickTime movies had a bug in reading the data. Conversions to MPEG 1 and 2 was broken. It's now possible to use an external USB or FireWire drive as boot disk, and authorize BarbaBatch on that. When converting mp3 files to mp3 (with possibly different settings), ID3 tags would not be copied, even when this option was switched on. Now supports the very low MPEG 2.5 Layer III sample rates for MP3 files: 8000 Hz, 11025 Hz, and 12000 Hz. Fixed crash when trying to add a split file to the input list. Pyramix IMAGE.DAT files can now be read when the PQ description file is called 'PQDESCR.txt'. Encoding to MP3 using LAME would fail on some systems when using a large batch. Fixed bug where AIFF files with corrupt value for number of sample frames in 'COMM' chunk would not be correctly interpreted. Now we check if that value is reasonable, and if not, we derive the real number of samples from the size of the sound data. Batch file playing was inadvertently gone bad during last update. Fixed several issues regarding file type recognition, in particular with file types where split stereo file pairs could be used. Raw file handling now also supports 24 and 32 bit little and big endian file interpretations, as well as multiple interleaved channels. Popups for raw file handling are now correctly set up. Number of samples for SDII files would sometimes be a few samples short. This could also result in regions not recognized. Normalized input files could yield silent output files when converted using look-ahead peak limiter and normalizer. This has been fixed. Fixed bug where certain compressed file formats would give an error -2098. Fixed bug introduced in 4.0.34, where maximum open files limit would be exceeded simply by adding a large batch to the input list. Fixed several issues regarding file and folder play. Fixed crashers with extremely large SoundDesigner II files. Fixed an issue with the 'gate silence' option, where the reverse would be done: not the silences, but the audio above the given threshold would be attenuated. MP3 conversion via LAME now also supports MPEG-2 Layer III files, where previously only MPEG-1 Layer III files were supported. This means that you can choose between three extra sample rates: 16 kHz, 22 kHz and 24 kHz. Broadcast Wave annotations were not always correctly read. Sometimes the text was incorrect, and for split files the annotation was not read at all. This has been fixed. From now on, BarbaBatch requires QuickTime 7, which is included in Mac OS X 10.4 (Tiger), but has to be installed explicitly by end users who are running Mac OS X 10.3.9 (Panther). SDII time stamps corrected, but now for real. Several memory leaks and open files problems. Split file issues, like correct name display and time stamp support where applicable. Wave µ-law and A-law files did not write extra data in the 'fmt ' chunk, as specified in the standard. Most readers didn't choke on that, but some did. This has been fixed. 4.0.28 - IMPORTANT: From now on, BarbaBatch will NOT run on Jaguar. It needs at least Mac OS X 10.3.9! Comment text for conversion specifications is now displayed in a separate column in the conversion table. We now use alternating colors in the input and conversion tables. Added conversion comment to log. When a comment text in a conversion specification dialog would be selected, BarbaBatch would crash when you typed backspace to delete the text. This has been fixed. Fixed recognition of (broadcast) wave files. Fixed writing of number of sample frames in 'fact' chunk of wave A-law and µ-law files. Readers often ignore this value, because most readers usually derive the number of samples from the audio data size. We now encountered a wave µ-law reader which was more strict in this regard, resulting in 'invalid wave file' messages. Fixed recognition of LAME encoder version. Fixed problem with temporary files, which would not be deleted in some cases. Improved reading of some Wave files. Fixed problems with large conversion batches. Normal Wave files (not just Broadcast Wave) are no also recognized as split files when they have .L/.R in their file names. You can now add a comment text to any conversion definition, which allows you to describe it more elaborately, or simply add some other note you wish to attach to a particular conversion definition. In the conversion definition window, click the triangle in the left bottom, labelled 'Extra Info', to show or hide the corresponding text entry field. For MPEG-4 Audio files, the bitrate specification is now per channel, instead of for the whole file. (We have plans to implement this for other file formats using bitrates as well.) This means that, when specifying a bitrate of 160 kbps, a mono file will get that bitrate, and a stereo file will get 320 kbps. The relative quality of such files will therefore remain the same. Older conversion definitions for MPEG-4 Audio files will automatically be re-interpreted when used. Fixed crashes and hangs that occurred sometimes when reading mp3 and m4a input files. Fixed a bug with large timestamps. Fixed accuracy for time format display. Normalize to ceiling: it is now possible to have a minimum value of -24 dB for the ceiling, instead of -12 dB. Split files are handled more graciously in the user interface and log files. A-law conversions had a noisy distortion which has been fixed. Log file names will no longer be simply numbered, but will contain a timestamp. Sample rate accuracy has been further improved. Under certain circumstances BarbaBatch could hang during sample rate conversion, an issue that could happen in version 4.0.20 and higher. This has been fixed. Also, in certain areas in the user interface, as well as in the program's code, sample rate accuracy is handled well. Split wave files would not be recognized as such (since version 4.0.20), but as mono files instead. This has been fixed. LAME options for mp3 now include an overall quality setting, making it possible to set a higher or lower quality than previously. Older versions of BarbaBatch 4 used the setting '2'. LAME options for mp3 now include a quality setting for variable bit rate (VBR). LAME options now allows you to disable writing of ID3 tags, so you only get them if you want to. Bit rate display for mp3 input files is finally correct, except for average (AVR) and variable bit rate (VBR) files, which get their first used bit rate displayed. Display of input files: for the calculation of sound file size, the resource fork size is now taken into account as well. Fixed some mixups between little and big endian terminology. Fixed a bug for LAME encoded mp3 files, where the converted files would not have the specified sample rate, but a lower one instead. Sample rates, specified with multiple digits of precision after the decimal point, would not be used with this full precision during sample rate conversion. This has been fixed. Sample rates can now be specified using a maximum of 4 significant fractional digits, and the resulting sample rate conversion will be done using this setting. During region extraction, empty region names could cause BarbaBatch to crash. Also, where it was previously not allowed to use colons (:) in regions names, this has been augmented by forbidding to use slashes (/) as well. If these characters are present, every instance will be replaced by a dash (-). Otherwise, these region names would mean trouble when trying to use them as file names. Fixed a bug where BarbaBatch would hang if there were duplicate region names. Fixed possibly corrupt region chunk sizes in BWF linear files. Fixed incorrect reading of AIFC IMA 4:1 files. The file playing option 'auto play next' has always been available in the Preferences window, and is default off. As a convenience, it is now also visible in the main window, to alert new users of its existence. When 'on', BarbaBatch will continue playing the next file, if the previous file has completed playing. Fixed an apparently long-standing bug where the total number of possible open files was exceeded during conversion, resulting in an obscure 'error in parameter list' error. This happened when the input files were in some way handled by QuickTime, which is the case for mp3 and m4a files, to name a few. After some 240 files the conversion would stop with the above error. Anything else would also be impossible from that point onward, unless BarbaBatch would be quit and restarted. Fixed a similar bug for conversions to LAME mp3, especially when extracting regions. You can now convert to as many mp3 files as you like, all in one go. Fixed bugs where BarbaBatch would crash if unexpected characters were used in AIFF marker names. When an input file or folder would be moved or deleted in the Finder, BarbaBatch would still create an output folder and issue a weird error. This has been fixed. Every item from the input list is now checked, just before it would be converted, and if it cannot be found, conversion will stop and the file or folder will be mentioned in the log, accompanied by the message: 'Expected input file not found'. Fixed numerous crashes and incorrect behaviors when playing files. CCITT G.729 files can now be read and written as Wave files. Long names of input files/folders will now be truncated in the middle instead of at the right, if they don't fit inside the input file table column. An ellipsis (...) will be shown in the middle of the file name in that case, to indicate that some characters are not dislayed. You can resize the table column to make it wider, so that a larger part of the file name can be made visible. Split SoundDesigner II files would crash when played, or with certain conversions. This has been fixed. Weird characters in file names would give problems when converting to mp3 with the LAME encoder. This is no longer a problem. Checking if the output folder is inside an input folder has been better implemented, and has more relaxed rules now. For example, converting a file which lives inside the output folder is not a problem anymore. Effectively, the only thing that is not allowed is having the output folder inside an input folder. This is to prevent BarbaBatch to generate an endless chain of nested folders during conversion. Fixed an input validation bug for LAME encoded files, where it would not be allowed to enter a four-digit number into the year field for id3 tags. Also, the track field is now properly limited to the range 01-99. MPEG I and II now have the option to switch frame padding on or off. This is to support older MPEG decoders, which don't handle wrong frame padding correctly. Dawn files sometimes have bad size indicators. We ignore them and read the files anyway now. LAME chokes on strange characters in file names, resulting in no output files being created. We made a workaround to make it work correctly. Region extraction to mp3 files using LAME would fail. This has been fixed. Added a preference to copy Finder comments, if present on input files. This is switched off by default, because in rare occasions users experienced crashes which we could not reproduce. Folder play: BarbaBatch will now play deeply nested folders as well, not just the top level files. If you start playing a folder, every playable file will be played, and every folder inside it will be searched for more files or folders. If the last file from a folder has been played, BarbaBatch will play the next file from the input list, following the folder just played. The preference 'Auto Play Next' has now the default value 'yes'. When mp3 files are converted to mp3 files, the ID3 tags from the input file are automatically copied to the output file. If any other file format is converted to mp3, the ID3 tags from the conversion specification are written to every output file. CCITT G.729 file output has been further improved, and these files can be played as well. File sizes under 1024 bytes were displayed as being 0 B large. This has been fixed. Folders were listed having a size of 0 B. This was confusing, because BarbaBatch does not traverse any folder to calculate its total size. Folders are now displayed without a size indication. mp3 files could not be converted correctly to mp3 files. This has been fixed. CCITT G.729 file format support has been extended to support big-endian (for Intel PC) data format, and a packed format, which is 16.4 times smaller than the original ITU formats. All variants can be read and written. Fixed a bug where the check if some input file or folder would be inside the output folder failed. Fixed a crashing bug when doing serial number checking. Some CCITT formats appeared not to work properly. This has been fixed. A crashing bug during file play, which could hang your machine, has been fixed. Changed layout of sound file info text in add files dialog. CCITT G.729 had a wrong default value for the bit rate popup menu, causing the conversion defininition dialog to stop accepting any input. Split stereo files sometimes had an extra '.L' in their name. This has been fixed. Region extraction did not work anymore since version 4.0.4. This has been fixed. WARNING: You cannot use 'strange characters' in any folder names for the output folder or any folder above it. Although most conversions will work flawlessly, no log file will be created and mp3 conversions using LAME will not render any converted files. We are investigating this issue for a solution, or any workarounds. Wave files will now correctly include loops and MIDI sample origin when 'copy extras' is selected. Fixed an important bug where the limit value in the boost section of a conversion specification would not be used, when the look-ahead peak limiter wsa used. The ceiling would correctly be used when only the normalizer was used. Fixed a bug concerning the conversion specification dialog, where the value from the current edit field would silently not be accepted. The previous value from that field would be used instead. Now, if you click OK, the value is validated and accepted. If it's invalid, BarbaBatch will beep and you should first enter a valid value, before trying to click OK again. Finder comments are now preserved, so output files will have the Finder comments copied from their corresponding input files. Snippet times can be specified more precisely: with three digits after the decimal point instead of one. If an input folder contains files which are not recognized as sound files by BarbaBatch, you can now specify that BarbaBatch just copies those files, instead of rejecting them (and logging an error). This is particularly handy if you need to convert a complex folder hierarchy containing valid sound files as well as other files, which you want to preserve. With this new preference setting switched on, the whole hierarchy will be transferred to the output folder, converting all recognized sound files in the process. You will see every copied or converted file mentioned in the log. Fixed file naming bugs where split stereo files were involved. Fixed a number of validation bugs in the Conversion dialog. BarbaBatch would fail to complain in some cases where the conversion specification was invalid. The Authorizer will behave better when there's no Shared folder inside the Users folder. Although BarbaBatch does not currently support surround files, it now takes surround files into account. Specifically, a file ending in '.L' is now taken as a mono file when it is recognized as being part of a surround set. MPEG layer 1 and 2 files converted to silence when split stereo MPEG or separate stereo MPEG were selected as channel treatments. MPEG layer 3 (LAME) files had clicks when using fade-in or fade-out in the conversion. Long file name support! Input file names longer than 31 characters are now allowed; maximum length is now 255 characters. Files or folders can now be added to the input list of BarbaBatch by dropping them on the application icon. Added a 'Remove All' button to the input list pane (although the same effect could be reached by doing a 'Select All', followed by pressing backspace). Added sound file info in file add navigation dialog, just like there was in BarbaBatch 3. 'Show license' will now open the license text in TextEdit. You can now show the output folder in the Finder. There is a menu command for that, as well as a button in the output section of the main window. As a convenience for folks who repeatedly convert files to the same output folder, we added a menu command to delete all files and folders from it. Since this is not undoable, we issue a warning first. You can delete conversions from the conversion table by dragging them to the Trash icon in the Dock. If you had some other conversions selected, they remain untouched. Deleting conversions by dragging them to the Trash is undoable, just like deleting using the Delete button (or backspace key). Added file formats G.711 a-law and µ-law. Added support for split Broadcast Wave files (.L.wav and .R.wav). Fixed a crashing bug when you tried to assign the startup disk as output folder. You can now safely use the startup disk's top level for BarbaBatch output. Fixed crashing bug while converting to Paris Linear files. More characters are now allowed to be used in conversion names. Only ':', '\' and '/' remain forbidden, since they can be part of a path name to a file or folder (on different platforms). A number of small configuration and validation issues regarding specific sound file types have been resolved. Fixed a bug where BarbaBatch would falsely complain about duplicate file names when files actually had the same name, but different extensions. Log file generation has been improved. Sometimes a log file would be created, although the preference setting for generating log files would state otherwise. This has been solved. If the user cancels a conversion, it is mentioned in the log file just once, not twice. The input file whose conversion was interrupted is printed with an asterisk in front, accompanied by the message 'User cancelled conversion'. When a log file should be written, but not if no errors occurred during conversion, the log file from a previous conversion is still correctly remembered as the last log. Fixed the handling of warnings and errors. Warnings are simply mentioned in the log file, and conversion is concluded with a 'Ping' sound of success. Fatal errors, however, are also mentioned in the log file, but the conversion process is immediately stopped with a 'Horn' sound, indicating that the conversion did not succeed. Fixed: when you would drag a conversion clipping into the conversion table, but one with the same name would already exist, it would still be accepted. Now BarbaBatch does not allow such a (otherwise valid) conversion to be dropped into the conversion table. Fixed a crashing bug (hang) when you tried to convert more than 242 files to mp3 using the LAME encoder. Fixed an issue where input files would not be sorted properly when you would sort them by size. Download the Barbabatch application, full version or demo here. You can activate Barbabatch to your hard drive (using challenge/response) by following the steps upon first launch of the application. 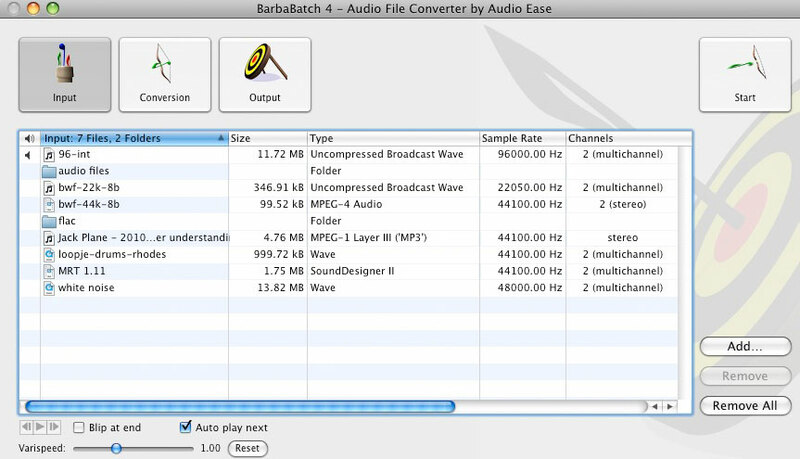 To enable mp3 output from Barbabatch you need to download and install this Lame MP3 encoder.